Selecting dance auditions that fit your goals is smart career planning. Every audition, however, provides an opportunity to learn from the experience. Make the most of your experiences by being ready for anything… before, during, and after your dance auditions. Choose technically appropriate piece(s) and those which show your uniqueness. Don’t try to perform anything that’s too difficult for your technical level. In the weeks beforehand, give several practice performances for your teacher, friends and family. Practice performing in the clothes and shoes you’ll be using. Make copies of anything you may need, e.g. sheet music, promo pieces, etc. 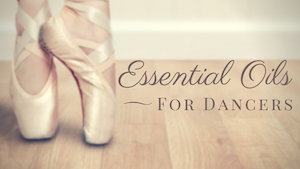 Check pointe shoe ribbons, review choreography, music, etc. Check to see if there are practice rooms or studios to warm up on site. Make sure your kit looks good and you have extra business cards. The most important thing to have with you is your headshot (8×10, black & white is still the standard) with a resume and/or biography attached to the back. 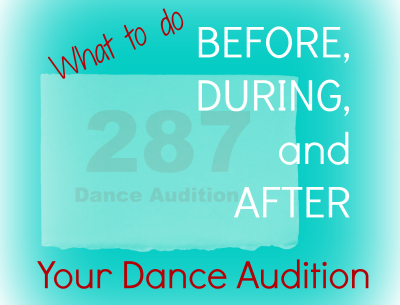 Always update your materials regularly, and re-order the information so it is tailored to each audition opportunity. Bring basic things like a photo ID in case you need to identify yourself at the audition. Don’t forget extra copies of your photo and resume. Always carry water and an energy snack. Bring extras of anything important – artistic, personal or medical. Stay calm, and collected, always speak slowly and clearly. Listen to a question and pause before answering. If you don’t know. it’s alright to say so. Arrive at least one hour before your audition to check in and find your way around. Be prepared to be flexible – many times you’ll only be asked to present a short section of what you have prepared, or to present an additional or different type of piece. Don’t forget to warm up beforehand. Before your audition begins take a quiet moment to mentally prepare. Stay focused on doing your best and don’t compare yourself to others. Enjoy yourself, after all an audition is just another opportunity to perform! One of the most difficult things about auditioning is having an accurate perception of how you came across. Just because you felt you did a fantastic job doesn’t mean the jurors did. But more often the reverse is true. We are usually much harder on ourselves than others are. Try not to take audition results personally particularly since you have no way of knowing all the factors that came into play in the decision-making process. Sometimes you can get feedback from the adjudicator’s notes if you call the office and request it. Start your own audition/jury notebook to write down any information you get (even if you disagree), as well as your own reflections on all aspects of the audition. Write down what you felt good about and the things you want to do differently in the future. The more you can learn and grow from the audition process the more success you will achieve. Depending on the time of your audition, you may need to eat more than a snack that day. Check out this recipe for a “nerve-calming” salad! Janaea Rose Lyn (McAlee) is the currently full-time faculty and Dance Coordinator at Estrella Mountain Community College in Arizona. 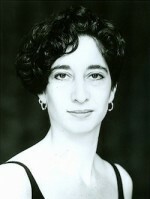 Previously she was Assistant Professor of Dance and Performing Arts Program Coordinator at Cecil College in Maryland. She is the author of Dance This Notebook with Artist Laura Higgins Palmer and is a contributing writer for Choreoclinic. Janaea was Founding Artistic Director of both Convergence Dancers & Musicians and Dance Matrix, and she remains active as a Third Generation Isadora Duncan Dancer. Information at www.janaearoselyn.com. This was awesome tips! thanks for this Janaea. Your list are very useful guide.